3 mm (0.12 inch) thick RAU-PVC extrusions from REHAU. 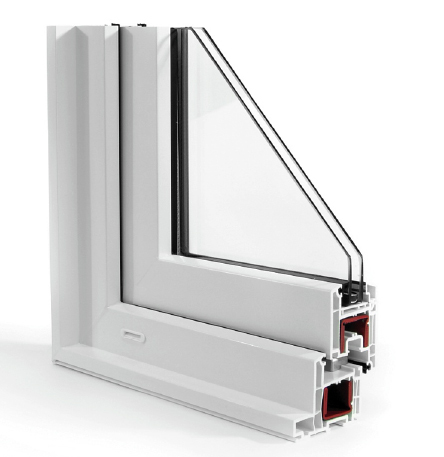 60mm, four-chamber design in the sash and frame increase strength and reduce heat transfer. Pockets for galvanized steel reinforcement when additional strength is necessary. The extrusions and hardware are so strong that when steel reinforcement and appropriate glazing is used, Tilt & Turn Windows can reach performance levels comparable to a 172 mph wind speed for uniform load deflection and a 210 mph wind speed for uniform load structural tests. 4500 Series Tilt & Turn Windows come standard with your choice of two superior insulated glass packages – a high Solar Gain package featuring Cardinal LoE 180 glass or a low solar gain package featuring Cardinal LoE3 366. Additionally, WASCO offers two high performance triple pane packages at fair prices — the Comfort3 Triple Pane for the greatest comfort or the Sustainability Glass Package, with triple glazing and two layers of Cardinal LoE180 glass, provides for even greater energy efficiency, as it achieves a very low U-Factor while maintaining a good solar heat gain coefficient for Wisconsin’s climate. WASCO uses the no-metal SuperSpacer® between the panes of glass for a warm edge. (Tempered and oversized units may be supplied with Cardinal XL-Edge® Spacer.) Supplied with three layers of double strength glass, this combination simply shuts out outside noise. 4500 Series Tilt & Turn Windows earn the EnergyStar® with dual pane glass and can achieve NFRC whole-window U-Factors below 0.20 Btu/hr•ft2°F with triple pane glazing.